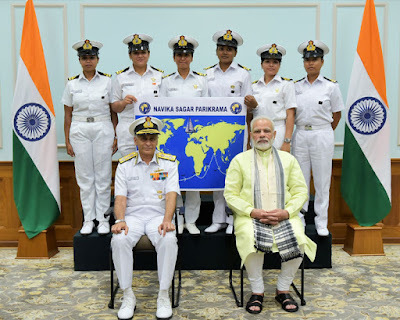 Prime Minister Narendra Modi with the Six women officers of the Indian Navy who are due to circumnavigate the globe on the sailing vessel INSV Tarini, The Chief of Naval Staff, Admiral Sunil Lanba is also seen. Navika Sagar Parikrama is a project wherein a team of women officers of the Indian Navy would circumnavigate the globe on an Indian-built sail boat INSV Tarini. This is the first ever Indian circumnavigation of the globe by an all-women crew. The project is scheduled to commence in early Sep 17. INSV Tarini is the sister vessel of INSV Mhadei. The project is considered essential towards promoting Ocean Sailing activities in the Navy while depicting Government of India’s thrust for ‘Nari Shakti’. The first Indian Solo circumnavigation was undertaken by Capt Dilip Donde, SC (Retd) from 19 Aug 09 to 19 May 10 onboard the Indian built vessel, INSV Mhadei. The first Indian non-stop solo circumnavigation was undertaken by Cdr Abhilash Tomy, KC from 01 Nov 12 to 31 Mar 13. 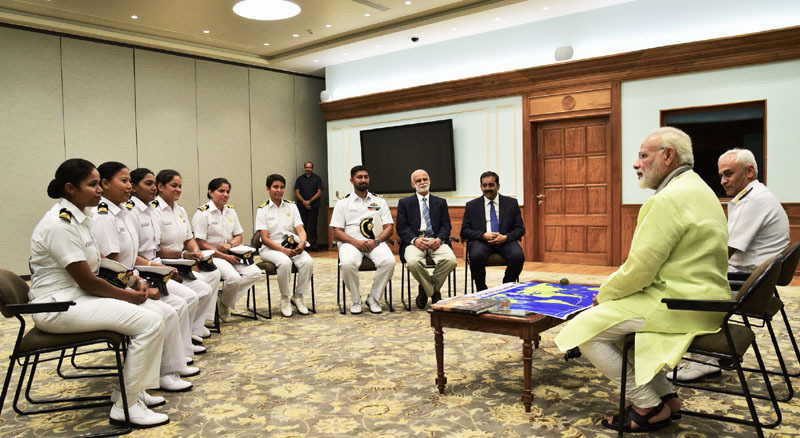 Six women officers of the Indian Navy, who are due to circumnavigate the globe on Indian Naval Sailing Vessel Tarini, called on the Hon’ble Prime Minister Shri Narendra Modi on 16 August 2017. This is the first-ever circumnavigation of the globe by an Indian all-women crew, who are scheduled to begin their voyage later this month from Goa, and are expected to return in March 2018. During the interaction, the crew explained details of their upcoming voyage to the Prime Minister. The Prime Minister wished the women crew well, and exhorted them to project India’s capabilities and strengths across the world. He also encouraged them to write and share their experiences, after successful completion of the voyage. INSV Tarini is a 55-foot sailing vessel, which has been built indigenously, and was inducted in the Indian Navy earlier this year. 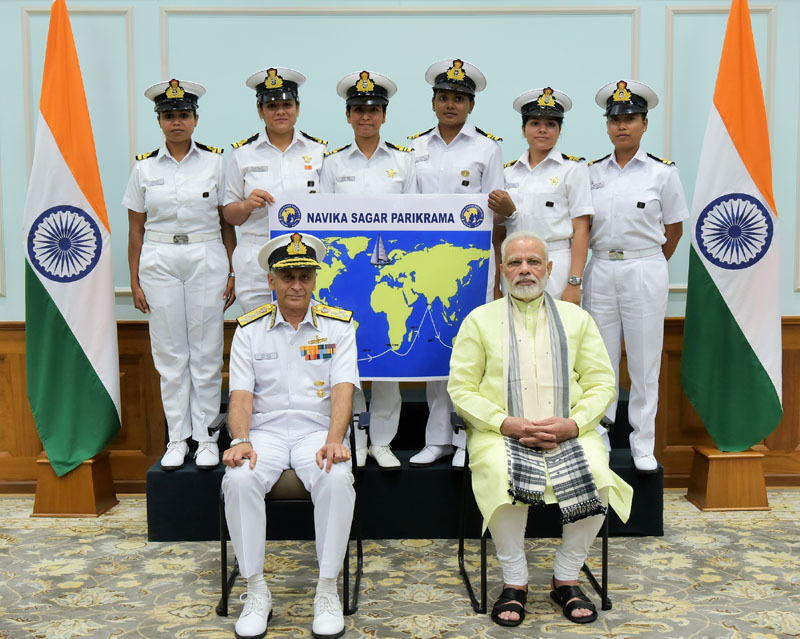 The vessel will be skippered by Lieutenant Commander Vartika Joshi, and crewed by Lieutenant Commanders Pratibha Jamwal and P Swathi, and Lieutenants S Vijaya Devi, B Aishwarya and Payal Gupta. The expedition has been titled Navika Sagar Parikrama and will be undertaken in five legs, with stop-overs at 4 ports namely Fremantle (Australia), Lyttleton (New Zealand), Port Stanley (Falklands), and Cape Town (South Africa). The officer has sailed from Rio De Janeiro to Cape Town in 2014 and from Port Blair – Vizag – Chennai – Kochi onboard Mhadei. She skippered INSV Mhadei from Vizag to Goa in Feb 16, Goa to Mauritius and back from May to Jul 16 and from Goa to Cape Town in Dec 16. The officer also skippered INSV Tarini from Goa to Mauritius and back from May to Jul 17. The officer has sailed onboard Mhadei from Goa to Port Blair in 2014, Vizag to Goa in Feb 16, Goa to Mauritius and back from May to Jul 16 and from Goa to Cape Town in Dec 16. The officer also sailed onboard INSV Tarini from Goa to Mauritius and back from May to Jul 17. The officer has sailed onboard Mhadei from Cape Town to Goa in 2014, sailed from Vizag to Kochi in Feb 16, Goa to Mauritius and back from May to Jul 16 and from Goa to Cape Town in Dec 16. She also participated in the recently concluded Cape to Rio race 2017. The officer also sailed onboard INSV Tarini from Goa to Mauritius and back from May to Jul 17. The officer has sailed onboard Mhadei from Vizag to Goa in Feb 16, Goa to Mauritius and back from May to Jul 16 and from Goa to Cape Town in Dec 16. The officer also sailed onboard INSV Tarini from Goa to Mauritius and back from May to Jul 17. The officer has sailed from Vizag to Goa onboard Mhadei in Feb 16, Goa to Mauritius and back from May to Jul 16 and from Goa to Cape Town in Dec 16. She also participated in the recently concluded Cape to Rio race 2017. The officer also sailed onboard INSV Tarini from Goa to Mauritius and back from May to Jul 17. The all-women crew have trained extensively for the forthcoming voyage. They have sailed approximately 20,000 Nm onboard INSV Mhadei and Tarini as part of training, which includes two expeditions to Mauritius (in 2016 and 2017) and a voyage from Goa to Cape Town in Dec 16. The expedition has been aptly titled ‘Navika Sagar Parikrama’, aimed at promoting women empowerment in the country and ocean sailing by the Indian Navy. The expedition would inspire the youth of our nation to develop an understanding of the sea and instill a spirit of adventure and camaraderie. (a) Nari Shakti. In consonance with the National policy to empower women to attain their full potential, the expedition aims to showcase ‘Nari Shakti’ on the world platform. This would also help to discard the societal attitudes and mindset towards women in India by raising visibility of participation by women in challenging environment. (b) Environment and Climate Change. Sailing encourages the use of environment friendly non-conventional renewable energy resources which affects the life of women. The expedition thereby aims at harnessing the energy to optimise the livelihood of the women onboard. (c) Make in India. The voyage also aims to show case the ‘Make in India’ initiative by sailing onboard the indigenously built INSV Tarini. (d) Meteorological/ Ocean/ Wave Data Observation. The crew would also collate and update Meteorological/ Ocean/ Wave data on a daily basis for subsequent analysis by research and development organisations. (e) Marine Pollution. The crew would monitor and report marine pollution on the high seas. (f) Interaction with Local PIOs. Since the expedition aims to promote Ocean Sailing and the spirit of adventure, the crew would interact extensively with the local PIOs at the various port halts.